Cycling physics, meaning, in this case, power, speed and endurance measurements, are essential when it comes to training, so those should not be overlooked. Let’s talk about power. Your power output is measured in watts, and it refers to the work you are outputting while cycling. The pedaling, the endurance, the resistance you pick, and the gear you choose. 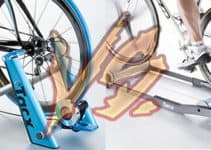 Your training can be carefully monitored by using a method which connects your pedals, chain or even handlebar to a device using Bluetooth technology measuring your power, speed and beyond, or you can get a smart trainer that has those features incorporated and does that by itself. Your skills can be bettered by analyzing your performance, either you are a professional cyclist or an amateur. 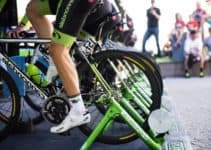 The force you apply to your pedals, and the cadence is read by the power sensor, which lists the data for you to evaluate and work on your cycling abilities. The power meter shows you the levels of effort you put into your workout, thus helping you understand how energy is changing every second by your pedal impulse. Effort can also be measured with a heart rate monitor, but it is not enough. The struggle of using only a heart rating training is that it simply doesn’t give you the full picture of your training session. Your power output – the effort you put into pedaling – is what makes you go faster, or somewhere when you ride outdoors, while a heart rate file is not enough to show you all the details you need. Speed and cadence might be displayed, but it does not show the real effort you are putting into your trainer to reach a certain MPH, as it is focused on your body’s effects, not the power you are putting into the trainer bike. Despite this, it is relevant to use both methods to check on your progress as an athlete. Your heart rate monitor, for instance, gives you your Training Load and Recovery Status, which is beneficial for you to know when you are undertraining or overtraining. There are sensors of many kinds, specialized in measuring different parts of your training. Other than the already mentioned power sensor, you can use a speed or a cadence sensor; you should pick the ones who suit the means of your training and which part you would like to improve or control during your training sessions. Of course, this means most professional cyclists try to get the most information on their training so they can enhance each aspect of it. Functional Threshold Power is commonly referred to as the highest average power a cyclist can reach and maintain for an hour. It is measured in watts and, with the help of a power meter; it determines training zones to measure improvement. To establish your FTP, you must undergo some different testing methods. Starting with a warm-up, go for a series of timed tests, the time depends on the methodology you pick. It could be a short set of 5-seconds to 20 minutes or a more extended 60-minute set. You will need to reach your best, your breaking point and hold it for one hour to know your real FTP. The watts you reach will not go up shall you continue your session, so your effort will result in lower power. Raw wattage does not teach you how much weight was moved to generate the number of watts noted, to maintain the same speed, different-weighted cyclists will reach different power, and their effort is only comparable using the general method of watts per kilogram. The relationship between Power and Speed on a bike is combined, the more power you apply, the faster you go over a given distance. It takes hard work to develop your cycling power, as does regarding speed and endurance, so let’s take a look at what can be done to get you to your best cyclist self. How can one improve their cycling speed and endurance? If you want to develop your endurance cycling abilities, you may want to start by riding in bigger gears and increase your cadence. This does not mean you need to start off by going to bigger gears from the starting point, it means, though, that you should spend a progressively longer time in a bigger gear than you would otherwise as you progress your rpm at the same time. By doing so, after a while, your endurance will have increased significantly, as you will notice when you feel more at ease with the higher gear and that your speed has increased considerably through developing a faster pedal stroke. You may train this on your bicycle trainer with pedaling one-legged while resting the other leg, then with both, then training the other leg. Do this for a few sets and your pedaling mechanics will be enhanced. A great way to improve your muscular endurance is by riding uphill, or, on a bike trainer, mimic that experience. The uphill riding means you can pedal at a moderate cadence in high gear for an extended period. Pedal force can be increased this way, as the cyclist tends to reduce cadence when doing so. Your distance/set must increase over time until you can complete a higher distance in a single go or, on the other hand, you can go for short sprint intervals that mimic steep hills with high-intensity, with recovery intervals in-between, as if you were riding downhill. You may also try to emulate the outdoor experience of riding into headwinds, also with recovery intervals. Acceleration training is quite adequate too, as you play with your normal speed and higher speed increasing the acceleration-per-ride number while you go. Block training is a way to go too when it comes to power, speed and endurance increase. This means you should do very hard training sessions for a few consecutive days, then use an equal amount of recovery days. This does not mean you must take days off necessarily; you may go for easy workouts instead. By facilitating the physiological adaptation process through block training and “resting time,” you will give your power a significant boost. Another way to boost power, speed and endurance is the 75 percent rule. This rule states that at least 75% of your time, or miles, should be under 75 percent of your maximum heart rate. 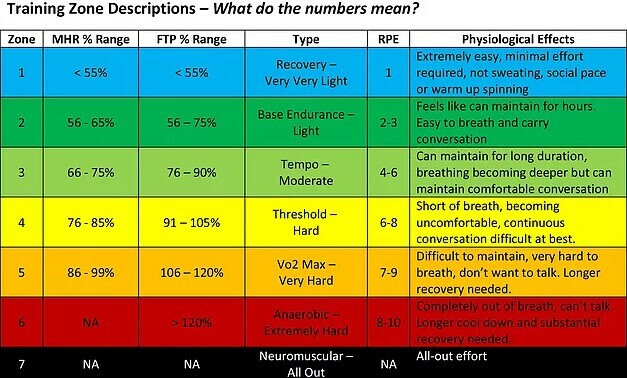 This means that three-fourths of you workout should take place in Zone 1 and Zone 2 of the FTP, which supports easy recovery and endurance building. The remaining percentage of your weekly mileage should be made out of really intense, Zone 5, riding. Your physiology will change with the short yet very intense versus the adequate recovery along with the endurance work. Power bursts can be draining but are also a great way to increase your endurance and muscle strength. Warming up correctly is key to this process, including some easy spinning and gear pulls to get your legs ready. Start with a lower cadence and speed and then shift to a big gear, then pedal while seated as hard as you can until you reach 80 rpm, then shift to an easier spin for a three-minute cycle at 90 rpm. This must be repeated during the session for the maximized result. You may do some cadence pedaling interval sessions to improve your neuromuscular coordination, thus elevating your pedal cadence. This workout session starts with a small gear, below your lactate threshold power, pedaling at 100 to 110 rpm. Do intervals increasing the length of the effort until you reach 3×15 minutes with a recovery of 5 minutes. Work on your endurance too, when working on your pedaling power. Do longer cycling sessions, therefore improving your aerobic and muscular endurance. This does not mean you should go over your limit every day or every week as it does not mean you should overstress yourself. You need to facilitate your physiological adaptation process by stressing your muscular and cardiovascular systems, but do not go too far. All you need is to lengthen your jaunt or ride a little bit for a big impact. Another way you can improve your endurance is by changing your patterns in cadence and gearing, so go beyond what your body is usually used to. Change your intervals, gears, and cadence or, for another great effect, push through one of your barriers in time cycling, resistance, distance, rpm, cycling schedule, etc. Fartlek training, which means speed play in Swedish, is a method in which you play with your speed with unorganized intervals. The training session occurs mostly within your comfortable endurance zone, but your aerobic and anaerobic systems can be put under stress due to the variable intensity of your cycling. Speed can be increased by the wheels you pick too, so do compare the ones available to get maximum speed training as the change can be dramatic. On another note, you might want to get as aero as possible; tight clothing is a must when it comes to gaining speed when cycling outdoors, so make sure you and your bike alike don’t offer too much resistance to wind. Nutrition can play its role too, with proper hydration and refueling before, during and after each training session, along with muscle building, and you should learn how to recover and rest too, this includes sleep, relaxation, and flexibility. There are interactive calculators available to measure and tweak the physical parameters of your speed and power. By using those, you can get a more complex look at your progress. These objects, along with the mechanisms mentioned before, will help you get the gist on how fast you can go and how many watts you are achieving, but don’t let the speed and endurance obsession overrun the importance of the ride. After all, it just helps you monitor your progress. Getting more power and getting faster does not come easy. You must efficiently train, work hard and rest accordingly and you must not get demoralized on slower days. This way you will know your power and watch the speed you need rise.